Saut Asylum (S-OH UHs-eye-luhm) is the unfortunate son of Svasra and Gehenna Asylum, born of a true-love-turned-nightmare tryst. Awkward teenager Gehenna fell head over heals for Svasra, and although the pair started off as the most saccharine sweet love-fest, it quickly soured when Svasra discovered her pregnancy. Left to deal with it on her own in Salsola, as soon as Saut was born she promptly took him to Inferni and dumped him on Gehenna. Gehenna, in turn, dumped him on his great grandmother Kaena Lykoi and half-sister Myrika Tears. Saut slouched around Inferni for his first two years of life, without direction or many friends. After the 2016 meteor and Kaena's subsequent death, he drifted away from the coyote clan and eventually landed in Sonnerie. There he found companionship among people whose lack of direction could certainly not be equated with lifelessness, so he stayed. Years passed, during which Saut discovered a warmth within himself that he put to work in defending the camp against thieves and caring for anyone there who needed physical or emotional nourishment. With the intention of eventually returning to Sonnerie, Saut departed mid-winter in 2019 to make amends with family he left behind in Inferni. Unable to find the coyote clan and concluding it had either disbanded or moved someplace else, he has set up camp in the Musquodoboit Valley while he figures out his next move. Although Saut is primarily wolf and dog, he is heavily hybridized: both of his parents are mixed species. All elements of his breeding are apparent in his appearance. 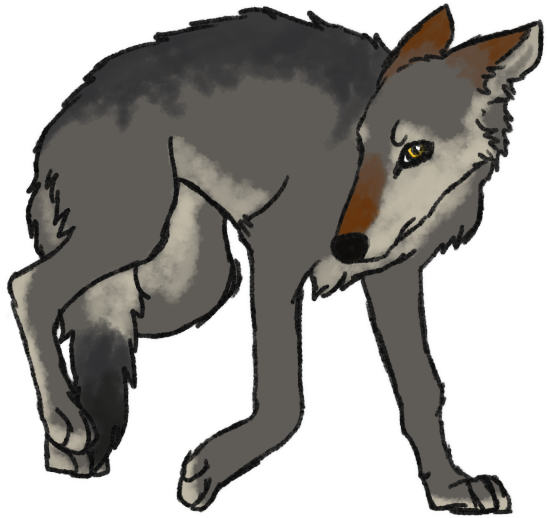 His wolfish blood shows in his size and bearing, his dog heritage gives him his lanky build and elongated features, and his coyote heritage gives him overlarge ears with a slender, delicate nose. Parts of Saut's fur are strangely long and silky. Some parts are curly, especially around his neck. His elbows and haunches are feathered, though not exceptionally long. His tail, however, is magnificently long and silky-furred. Otherwise, he has the thick, double coat of a wolf, and is well-equipped for cold weather. Saut's Optime hair is wavy and reaches just past his shoulders. He has a long nose, reminiscent of a sighthound, though it is not quite as defined as his father's. The coyote and wolf muddle it too much, making it shorter and deepening the stop between his eyes. His eyes are, however, almond-shaped and very sharp. He has excellent distance eyesight, and unlike his father this does not come with any cost to his olfactory system. Saut is very tall, though is build is more athletic than willowy or thick. He has narrow shoulders, well-toned arms, and runner's legs. Due to his height, he tends to stand out in a crowd despite his dusky and monochrome coloration. His Lupus form is the most doggish of them all. His chest is too deep and large for a wolf or a coyote, and his skinny, runner's build is more apparent in this form. While he lacks the breathtaking speed of a true sighthound, his deep chest and large lungs do incline him to be a better runner than most. He is moderately humanized in his bearing and movements, but he dislikes the constraint of most clothing. Saut's Lupus form is the most doggish of all of them. His chest is too deep and large for a wolf or a coyote, and his skinny, runner's build is more apparent in this form. While he lacks the breathtaking speed of a true sighthound, his deep chest and large lungs do incline him to be a better runner than most. 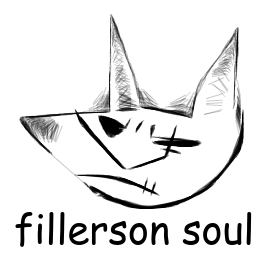 His Optime form is angular, sharp, and tall. With long legs and striking height, he tends to stand out in a crowd despite his dusky and monochrome coloration. Several, mostly concealed by his long fur. Two or three small vertical lines are occasionally visible beneath his Chaos Star. Saut doesn't usually wear clothing, though he has a thick cloak to wear in inclement weather. Speech: Saut's voice is typically emotive and breathy to the point of being a bit rough/growly, sometimes. He speaks prefers short sentences to long ones with lots of details. (His voice resembles Luke Evans). General Posture and Body Language: Typically relaxed and unconcerned unless the situation calls for alertness. He leans forward when he's very engaged, and makes intense eye contact. Direct - Saut doesn't sugarcoat, but he tries not to offend, either. Fraternal - Saut tends to make friends easily, though this isn't without considerable effort on his part. He wants to get to know you, and then he wants to quickly attain the point that he can consider you family (and be considered family, in turn). Hedonistic - Possibly arising directly from the aimlessness of his youth, Saut appreciates his idle time, and prefers to use that time in pursuit of something that will bring him instant gratification. Lazy - Follows from the above. He requires some prodding to do anything that interferes with fun, pleasure, or relaxation. Dislikes: If you don't like your kids, Saut probably doesn't like you. Sociability: Saut actively seeks out conversation and companionship. Expression: Extrovert. He's pretty obvious about what he's thinking or feeling and rarely feels the need to hide it. Packs: Saut is hostile towards Salsola as an entity, and looks on Salsolans with pity and disgust. Gender: He was raised by a gaggle of women. He feels slightly more at ease around them, and forms female friendships more quickly than manly-male friendships. Age: Saut likes the elderly. He tends to be calmer around them and loves listening to stories or helping them out. He also adores children. Wimps: Saut has a slight dislike/annoyance for those who complain and whine about their lot in life. Parenthood: He instantly disapproves of neglectful, abusive, or absent parents; it is an irredeemable flaw in his eyes, unless the parents in question actually change their behavior. He's most attracted attracted to steady, kindly females and non-domineering and non-intimidating males. Storytelling (Journeyman): For children, mostly. He uses voices and puts his whole body into it, but he'd be a little embarrassed to act so goofy around other adults. Hunting (Apprentice): Taught by Vesper when he was young. It's been a long time, and he's pretty rusty, especially when it comes to Lupus hunting. Reading/Writing (Journeyman): Saut can read most things, thanks to Myrika Tears. His writing is weaker, and only a little legible, but he can do it. Fishing (Journeyman): In both forms. Saut eats as much fish as terrestrial meat. Travel (Master): And all that comes with it. Saut knows just the right pace so that he can attain great distance without exhausting himself or his companions. Making/breaking/maintaining an organized camp, he's got. "Reading" his surroundings (Master): For lack of anything else to call it. Saut recognizes different land types and knows in general what sorts of animals and plants he can expect, there. He often uses these cues to navigate, and sometimes to hunt. Canadian French (Journeyman): Picked up a good deal of French in Sonnerie, understands it a lot better than he can speak it. Kaena Lykoi aka Gramma: She pretty much raised Saut. She was the closest thing to an actual parent that he had, and he relied on her for advice and familial warmth. Her death motivated him to leave Inferni. Myrika Tears aka Aunt Myrika: His aunt. She helped raise him and spent the most amount of time with him (aside from Kaena) during his youngest months. Saut looks up to her and misses her sorely. Vesper aka Aunt Ves: She was also around when Saut was young. He misses her and worries she judged him for leaving. Sinech Dalisani: Friend! They hung out. Vicira Tears: A cousin who Saut once envied and admired. Svasra: Sought her out in Salsola, when he was barely old enough to make the trip. He barely thinks about his parents, anymore. Gehenna Asylum: His father was around in the first day or so in Inferni, and that was it. Only saw him a few times during his childhood, but never approached because he was afraid of the man's reaction. He met a few people in Sonnerie who knew his father as a child, and has softened towards the thought of him. Rimel Molle: His wet nurse. Saut barely remembers her. Saut sneaks out of the Village and is intercepted by Snapdragon Lykoi. Caught in a rainstorm, Saut takes shelter within the lighthouse at Charon's landing. Vendetta Massacre finds him there and does his best to comfort him. Saut plays with Yari while Kasia Salazar works nearby. He tries to convince Belial Massacre to play, too, but the man doesn't seem interested. Saut has snuck out again, and is intercepted by his "aunt" Vesper. Instead of lecturing him, she jests with him. Saut and Kallistos Moineau slide on the Folly Lake ice. Saut encounters the skulls lining the boarder for the first time, and get some not-so-comforting reassurance from Prophet de le Poer. Saut "helps" with the preparations for Inferni's bonfire. After trailing his scent, Saut runs into Belial Massacre and grows frightened by a demonic shadow accompanying him. Saut wanders over the border and meets Artemisia Eternity and her biologically-male daughter, Quicksilver Lykoi, under different guises. "Ophelia" talks of family with him while he makes friends with "Francis." Saut digs a bunch of tunnels in the snow and is thrilled when Veine von Rosnete falls into the trap. She is less pleased than he figured she would be, and they engage in a game of cat and mouse. Saut plays with Merlin Knight over the borer. Despite being told not to, Saut attempts to travel to Salsola to meet Svasra. Instead, he runs into Orvar Stormbringer. Saut arrives at Salsola's border and is spotted by Delphinium D'Angelo. Svasra spots Saut the next day, just across the boarder. The meeting begins well, but upon seeing Wendigo Novosad in her arms he runs away with no intention of returning. Saut, Vicira Tears, Dorcas de le Poer, and Izual Massacre set out to find Denise Bellamy after she disappears from hospital house. Saut hangs out with Inferni's rabbits and then searches Vesper for fleas. Saut meets Liam Kaelan. OOC it was decided that they'd fight, but the thread was unfinished. Saut runs into Artemisia Eternity again, under a new guise. Unfinished. Saut runs into Roman Cremini and Gypsy Chanterelle in the Grimwell Caverns and helps rescue Gypsy after she gets stuck in a difficult-to-reach cranny with a migraine. Liliarys Ven'detta is bullied by a raven, and Saut comes to her rescue. Sinech Dalisani accompanies Saut when he goes to poke around Anathema's borders after they move back to their old territory. They run into "Lukos" and things get creepy when Saut can't control himself. Saut falls in some mud and gets grumpy. Saut meets Hyacinth Silevue during a storm and helps her find shelter. Saut moves from the Great Village to the D'Neville Mansion.